Photograph courtesy of Department of Services, Technology and Administration. Cassie and I were invited to visit the Department of Services Technology and Administration (DSTA) recently to see their audio digitisation project. 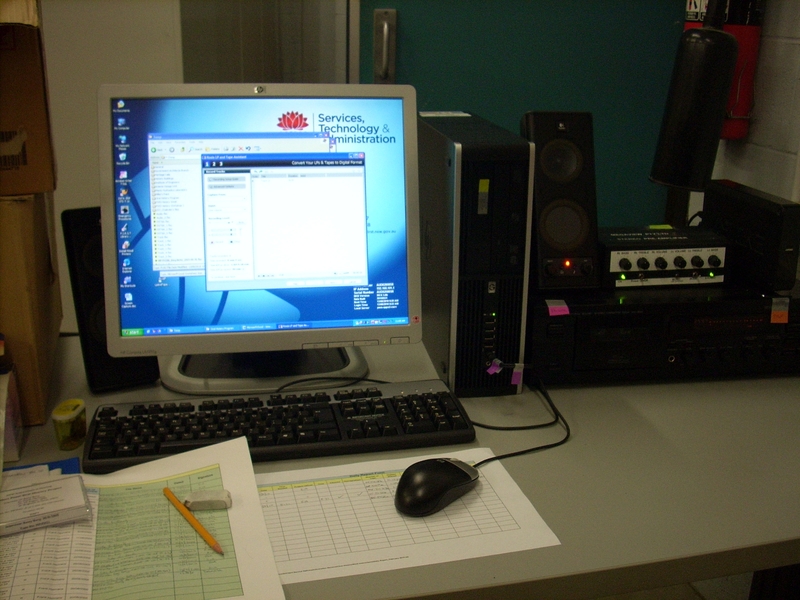 The Records Project Team were in the process of converting around 550 audio tapes to digital format. The tapes are the product of an oral history program operating within the Department (and its predecessor Departments) from the 1980s until recently. Some tapes are also from related oral history collections created by other organisations such as the Roads and Traffic Authority and the Department of Housing. The tapes contain a wealth of historical information about a wide variety of topics including the Newcastle earthquake, flood mitigation in the Hunter Valley, programs to build schools or restore sandstone buildings and heritage listed houses and the building of the Sydney Harbour Bridge. DSTA were digitising the tapes into FLAC (Free Lossless Audio Compression) in preparation for transferring the masters to the State archives. Due to the large number of tapes it was considered more cost effective to digitise internally rather than to use a service provider. FLAC has both pros and cons as a preservation format. It is an open standard with full lossless compression, which is good for archival preservation, but it is not as widely supported as formats like WAV or MP3. However the team found that it could be converted easily into these formats if required. The project commenced in January 2010. When we visited they had digitised 450 of the 550 tapes. At the end of the project State Records will receive the digital masters of the recordings and the masters of the analogue tapes. A backup copy will be retained by the Department for reference. While there have been a few small problems, the project has been progressing very well. Having a united team and excellent support from IT practitioners has been essential to its smooth operation. The team has also planned the project carefully and there are meticulous procedures, documentation and quality control standards in place which are no doubt contributing to the project’s success. For more information regarding this project, see the case study Preserving oral history: Department of Services Technology and Administration. This is part of our new guidance on Managing audio and video recordings which has been added to the Managing digital records guidelines.